Lighting Finesse in the “One New Change"
“One New Change” is the name of the building that Jean Nouvel has erected in London’s Bread Street, just around the corner from St Paul’s Cathedral. Undisputedly, the edifice has introduced “a change” to this part of the British capital otherwise so classically dominated by historical stone façades. 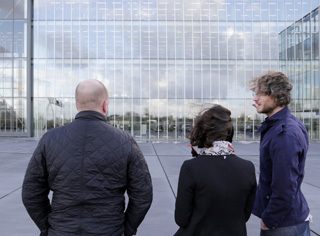 By contrast, the French architect’s output appears almost weightless, with vitreous façade reflecting the Baroque cathedral like a kaleidoscope. 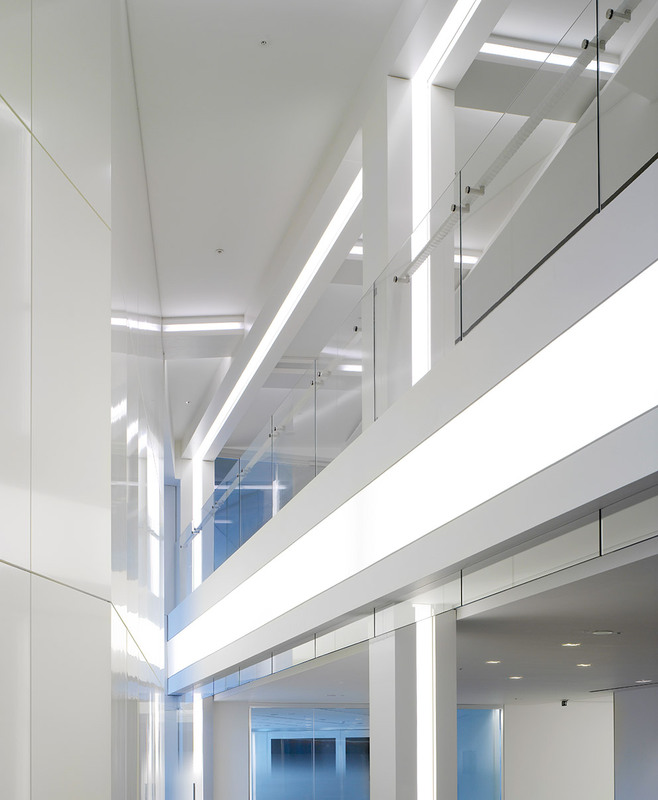 Planning the premises for K&L Gates solicitors the team at LSM Architecten deliberately continued Nouvel’s play with transparent surfaces and light reflections on the inside, creating bright, light-infused offices across two floors. 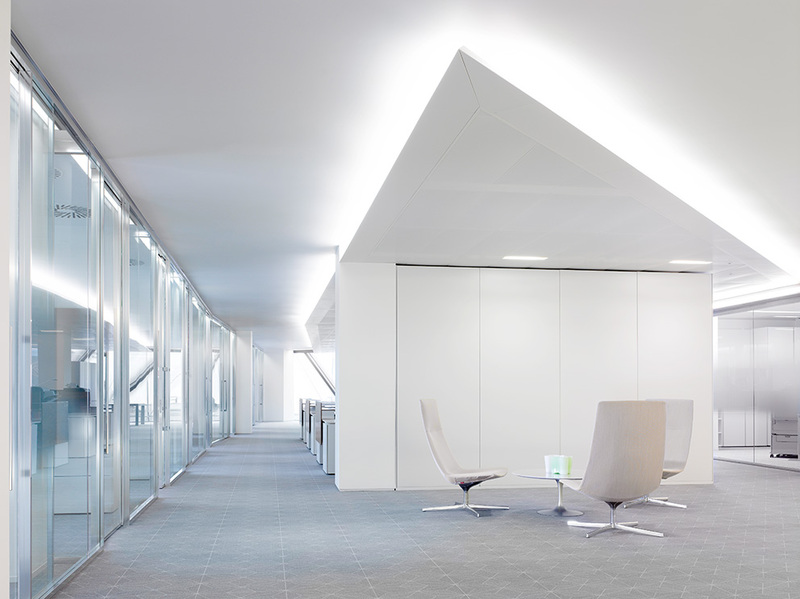 Lighting solutions by Zumtobel ensure well-balanced illumination and a productive working atmosphere throughout. “In line with the law firm’s international expansion, we have formulated a clear and modern aesthetic idiom for K&L Gates that stands out for its extraordinary fusion of spatial effects, light and art. 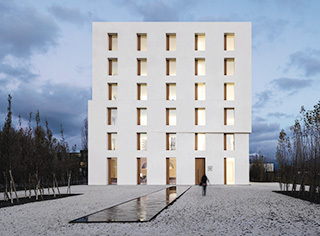 Daylight plays a major role in this concept,” is how Debra Lehman-Smith explains the approach by LSM Architekten. 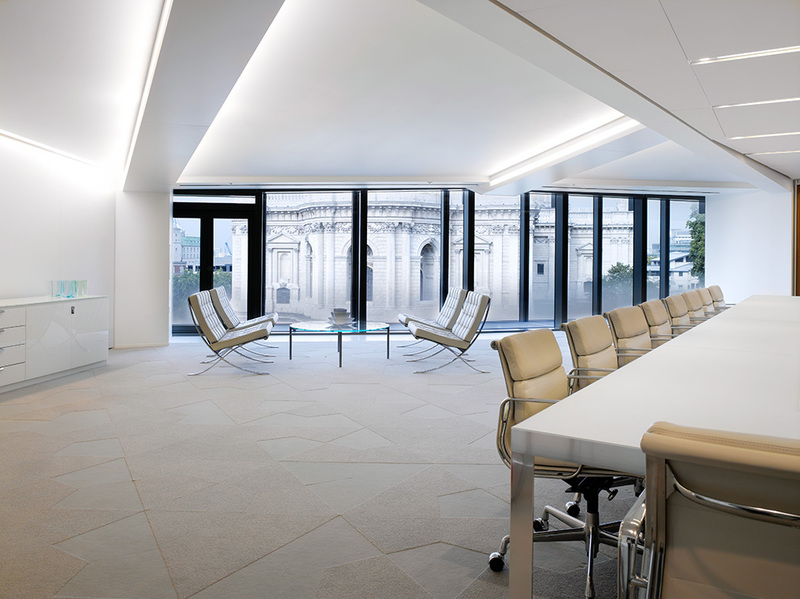 Consequently, the architects opted for a bright, modern and purist look-and-feel, complete with glass partitions and white marble floors and ceilings. Floor-to-ceiling windows flood the rooms with daylight that bounces off bright and transparent surfaces. 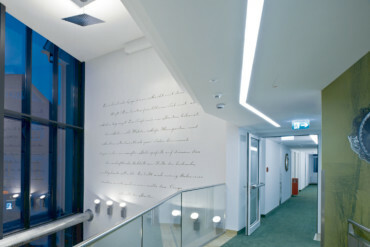 The effect is complemented by lighting solutions by Zumtobel. 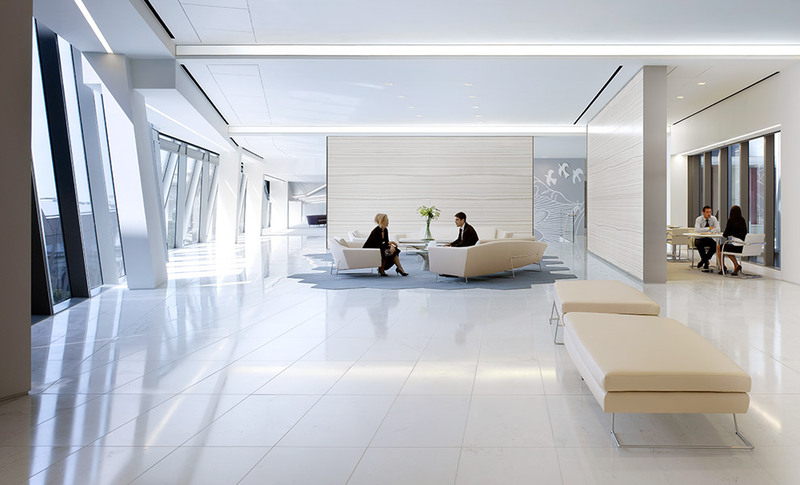 Lighting planner Christopher Seider of Seider Lighting Design opted for strip lighting from Zumtobel’s “Slotlight 2” series. 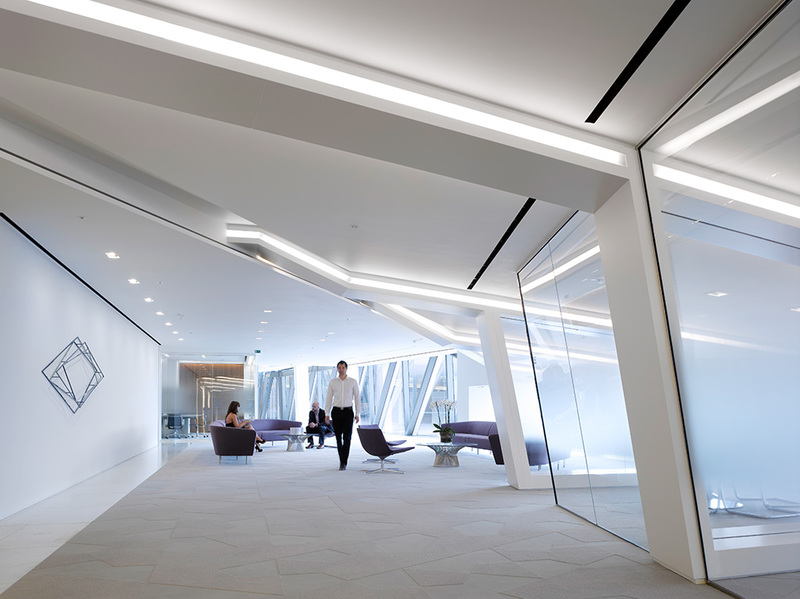 Recessed luminaires were flush-fitted in ceilings and walls to accentuate spatial edges with their warm and homogenous light. 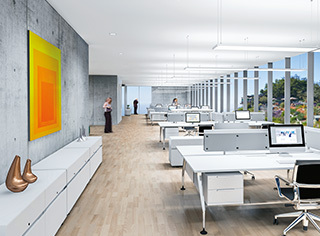 In the single and dual offices Seider used strip lighting with 4,000 Kelvin, a color temperature that is felt to be especially pleasant and is said to create a productive working atmosphere. 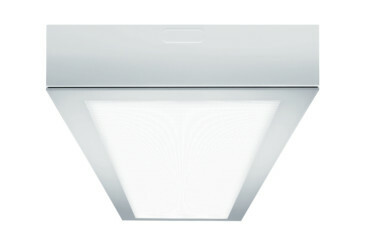 In the general zones a color temperature of 3,000 Kelvin is sufficient. 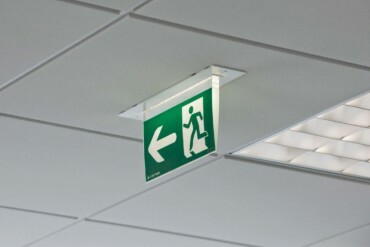 Round recessed luminaires in the ceilings – all from the “2 Light” series – provide spotlighting for individual workspaces and complement the overall lighting concept. The architects opted for a bright, modern and purist look-and-feel, complete with glass partitions and white marble floors and ceilings. 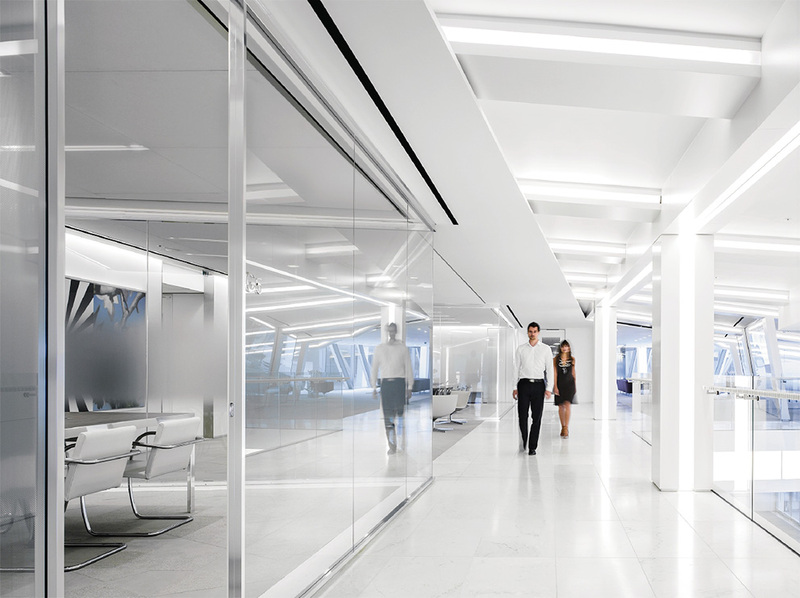 Lighting planner Christopher Seider of Seider Lighting Design opted for strip lighting from Zumtobel to highlight the architectural details. 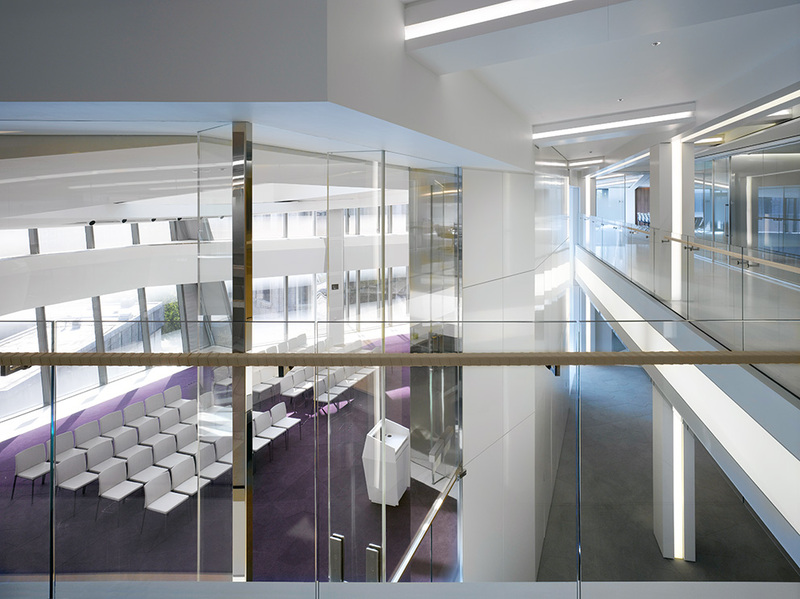 The strip lighting and floor to ceiling windows make the offices spaces appear bright and friendly even in London rainy days. In the general zones a color temperature of 3,000 Kelvin is sufficient. 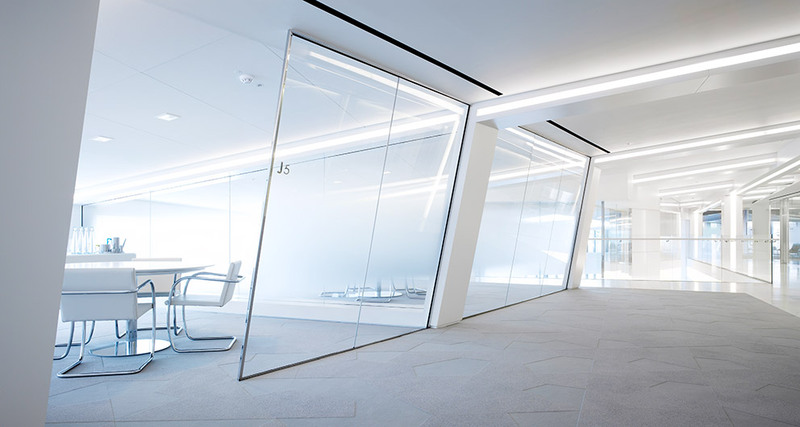 Washington-based architects LSM designed the 10,000 square metre office area in cooperation with lighting designer Christopher Seider of Seider Design in Berlin. 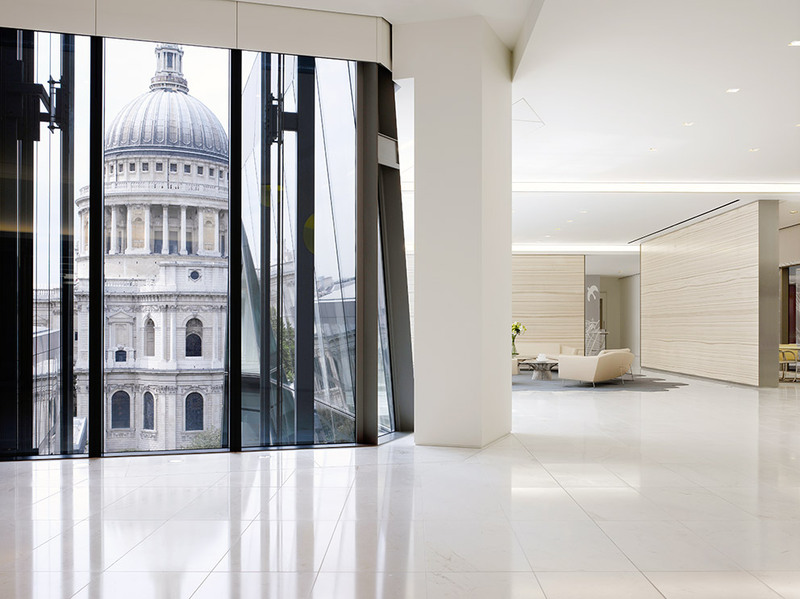 From the offices of the law firm you have an amazing view to the St Paul's Cathedral. 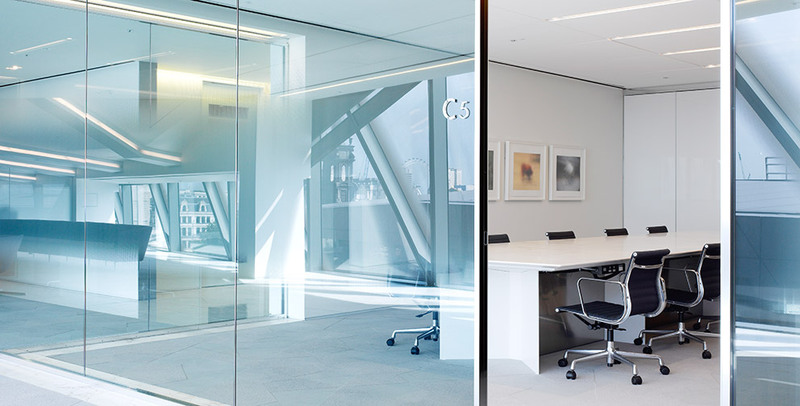 The continuous row lighting also serves to subtly delineate the different areas of the office. 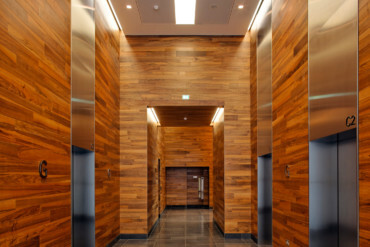 The “2226” office building by Baumschlager Eberle eschews any heating or cooling technology – yet works perfectly well thanks to high-tech features included in sensors and control technology. Hot or cold: What light do you prefer? 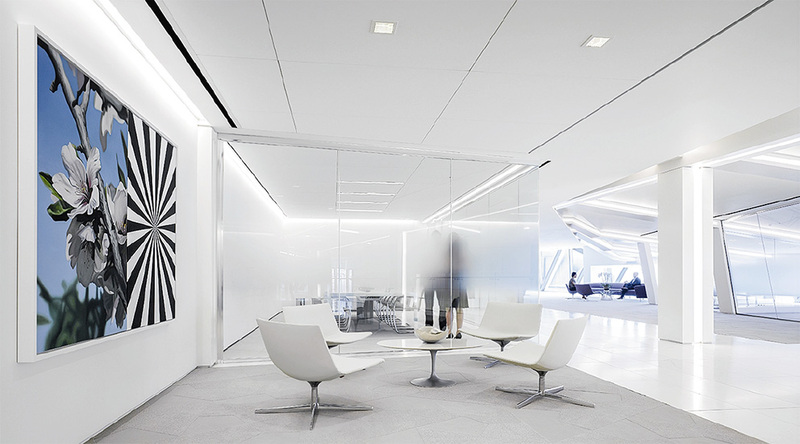 Light affects our body, brings dynamism into the office and makes work easier.